Manufacturers are faced with a few options when choosing the best type of pallet for their needs. For example, should you choose wood or paper? We’re here to tell you paper pallets are more cost-effective and more customizable than their wooden counterparts. Learn more on the differences between wood and paper pallets here. That customization is what we want to focus on in this article. 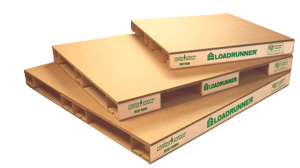 At Conitex Sonoco, we are big proponents of the benefits of corrugated paper pallets. That includes the eco-friendly aspects of these pallet types but we also view these pallets as a more user-friendly option. Let’s look at the options users have to choose from. You’ve heard that paper pallets are customizable. But just how customizable are they? Well, they’re designed to take on different sizes and shapes depending on your needs. Standard corrugated paper pallets are a great alternative to wood and plastic pallets. These paper-based pallets are lightweight and heavy duty. How? It has everything to do with how they are built. A single pallet has a load capacity of up to 10,000 lbs. They also weigh ⅓ of what wood pallets weigh. Check out our blog “Paper Pallets: Are they strong enough” for more. Bulk bag pallets are made specifically to support FIBC bulk bags. These pallet types not only save loading time and reduce shipping costs, they are built for stability and can safely stack heavy bags. No more tipping, wobbling or distressing your bulk bags. PLUS: the lightweight nature of these pallets means more inventory space, less deadweight in packaging and lower shipping costs. With paper pallets, you aren’t limited to the shape of a square or rectangle like you are with wooden pallets. If you or your clients want to display your product, a round pallet is perfect for you. 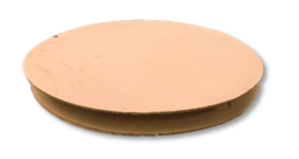 A round-shaped pallet lets your product be seen from multiple angles without any sharp edges poking out from the base. This equates to more visibility and a better chance to make a sale without sacrificing strength or durability. Those are just the types of corrugated paper pallets that are out there. Paper pallet customization extends beyond the shape or function of the pallets. It’s all based on your product and what you need out of your pallets. Runners are an important part of how paper pallets work. They’re built to fit any size and strength requirement. 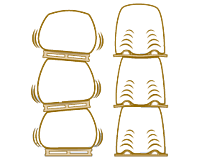 Custom designs provide specific support and protection for loads that are not evenly distributed on pallets. Last but not least, the bottom of a paper pallet can be customized as well. This part of the pallet is based on your product’s strength and stability requirements. The cut of the bottom sheet is determined by the device you’re using to handle the pallets. There you have it. Not all paper pallets are the same. If you have a specific need, there’s a paper pallet for your product. Talk with any one of our team members to get started on designing your custom paper pallet to take your process to the next level.